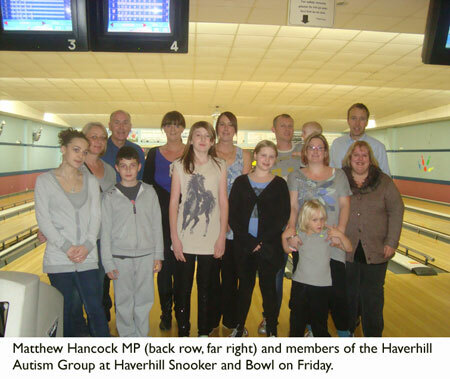 Haverhill's MP Matthew Hancock spent an evening with the autism support group in Haverhill at the town's snooker and bowling club. At the invitation of the Cllr Pat Hanlon, Mr Hancock attended a Haverhill Autism Support Group bowling evening at Haverhill Snooker and Bowl. 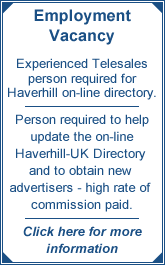 He was accompanied by Cllr Anne Gower who has the Haverhill and housing portfolio on St Edmundsbury Borough Council. Matthew said: "I particularly wanted to meet members of Haverhill Autism Support Group as we have been in touch before and I have great admiration for parents of autistic children. "I want to support them wherever possible as they argue for better facilities for autistic children and I thoroughly enjoyed meeting the group. "The group is achieving a lot already and provides a great support network for families with similar difficulties."